The beer culture in Los Angeles went dry in 1979 following the closure of the Eastside Brewery’s Lincoln Heights facilities. The fall of the once-cherished brand was one of the biggest precursors to the dominance enjoyed by mass-marketed beers among Angelenos in the following decades. But the tides have turned, and local breweries nationwide are taking their market share back. Some of the beer-makers who have led the charge in L.A. shared their insights about the beer economy, community and the unlikely pairing of avocado and alcohol. After only eight years in business, the owners, brewers and other staff members at Eagle Rock Brewery are used to being recognized as the “veterans” of the Los Angeles brewing scene. “We kind of had nothing until the last few years,” said Lee Bakofsky, the brewery’s production manager, describing the local brewing landscape in Los Angeles. Eagle Rock Brewery became the first microbrewery in Los Angeles in over 60 years when it opened in 2009. It’s been the first of many. “Hops take a solo,” according to the brewery, in its version of an India Pale Ale, the beer that helped popularize craft beer. Embracing the camaraderie among local brewers, Eagle Rock teamed with Los Angeles Ale Works to create a Le Banquet Biere, a saison/farmhouse ale style of beer with a fruity complexion and mildly spicy overtone. It’s more creative offerings include the A-Stout, with a dark body and notes of toffee appealing to coffee lovers. Besides its beer, the brewery takes pride in cultivating a community for the growing number of Angelenos looking beyond the typical name brand beers. 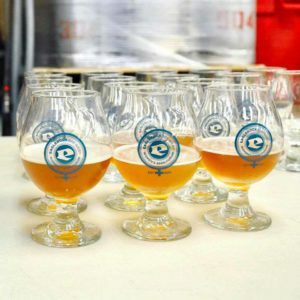 Part of that mission has included its Women’s Beer Forum, held on the third Wednesday of every month. The brewery presents four beers and educates attendees about each one’s style, characteristics and other aspects of its profile. Statewide, 3.7 gallons of beer were produced by craft breweries for every adult 21 and over, according to 2016 Brewers Association Statistics. California also ranked second in the nation in beer produced by craft breweries – approximately 3.3 million barrels per year. The number of breweries in the state reached 623 last year, nearly triple compared to five years prior. The craft brewing craze has slowed down a little bit, but the industry’s market share continues to hold its own against the typical mass-produced beers sold in bars and liquor stores. The recent trend of larger, corporate brewers buying up craft breweries to maintain their market share has led to a greater appreciation for local, independent beer makers. “As long as people never lose interest in knowing where the beverages they drink come from, we’re in good shape,” Garcia said. Its beer list includes Anything You Can Do We Can Do Bitter, an English bitter; 2 North, a brown ale; and Dwarfzig!, a pale wheat ale. Eagle Rock Brewery is located at 3056 Roswell St. The brewery doesn’t serve food, but there are typically food trucks right outside its taproom. Its hours are Tuesday to Friday from 4 to 10 p.m., Saturday from noon to 10 p.m. and Sunday from noon to 8 p.m.
An influx of luxury apartments, coffee shops, yoga studios, restaurants and bars have transformed downtown Los Angeles into a much trendier area in recent years. Breweries, in particular, have been at the forefront of the new downtown. In the northern corner of the Arts District, Angel City Brewery and Arts District Brewing Co. anchor a multiple block radius emblematic of the new downtown. But the southern edge of the Arts District still had room for improvement when Iron Triangle Brewing Co. opened its doors in January 2016. Kale Bittner, Iron Triangle’schief operating officer and chief financial officer, recalls the homelessness, prostitution and other signs of decay on Industrial Street, in between Alameda and Mill streets. After working as a brand consultant for restaurants, Iron Triangle founder Nathan Cole decided to open a brewery after trying his first IPA about eight years ago. He quit his full-time job in 2013 to focus on opening the brewery, and hired staff a couple years after that. Iron Triangle’s name pays homage to the city’s past. Over 100 years ago, Los Angeles’ chief water engineer William Mulholland, Los Angeles Mayor Fred Eaton and engineer Joseph Lippincott helped turn the Los Angeles Aqueduct into a reality. Known as the Iron Triangle, their accomplishments helped Los Angeles grow into one of the world’s premier cities. Now that its section of the Arts District is a little cleaner and safer, the staff has been able to focus more on the beer. Iron Triangle doesn’t use pickles, crème brûlée, squid ink or other gimmicky flavors that have made headlines for various breweries around the world. Instead, its beer list stays truer to classic brewing traditions. 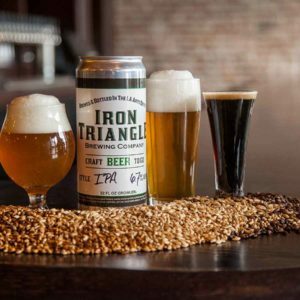 Iron Triangle Brewing Co. is located at 1581 Industrial St. It’s open Monday through Thursday from 5 to 10 p.m.; Friday from 4 p.m. to 1 a.m.; Saturday from noon to 1 a.m.; and Sunday from noon to 10 p.m.
Angel City Brewery has been at the forefront of the burgeoning beer scene in Los Angeles over the past several years, especially in the downtown Arts District. It also made headlines once again this summer for its Avocado Ale, and for the accompanying fifth annual Avocado Fest in August. Distributors from places including Brazil and Washington, D.C. have asked whether Angel City can ship some out to them (no, unfortunately for beer drinkers around the world), and brewers from as far as Australia have contacted Angel City seeking advice for crafting their own avocado brews. Some of its offerings for the fall season are Saazberry (inspired by one of the flavors on the lick-able wallpaper in the original Willy Wonka movie), while avoiding the cloying, syrupy aftertaste of other fruit flavored beers. Paying homage to the annual German festival, Angel City’s Oktoberfest lager is true to its Bavarian roots with its medium body, auburn color and notes of caramel. Caramel is also prominently featured in its Salted Caramel Gose, a sour wheat beer with a hint of vanilla. The Arts District was “definitely on its way up” when Angel City moved in several years ago, according to Melissa Corbin, the brewery’s events manager, recalling several years ago when Angel City opened its current location. “We had a lot more regulars at that point who had been here since the ‘80s and had kind of really been a part of making the arts district what it is,” she said. Angel City still honors the area’s artistic roots. The outside of the building is adorned with a mural by street artist JR – it’s also featured on the six-pack packaging of the Angel City IPA. The brewery also holds weekly Paint Nites, an artist-guided opportunity to paint while drinking beer. 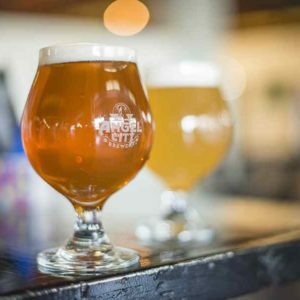 Events at the brewery in October include its recurring Tacos and Trivia Tuesdays every Tuesday; Beer Bazaar, held weekly featuring local arts and craft vendors with beer and food from local food trucks; and Run, Yoga, Beer, which starts out with a run for runners of all skill levels going past some of downtown’s historic landmarks. Angel City Brewery is located at 216 Alameda St. Its hours are 4 p.m. to 1 a.m. Monday through Thursday, 4 p.m. to 2 a.m. on Friday, noon to 2 a.m. on Saturday and noon to 1 a.m. on Sunday.